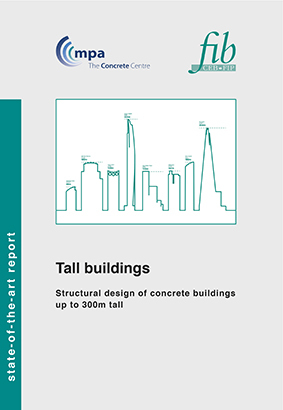 fib Bulletin 73: Tall Buildings is the result of a collaboration between the fib and MPA The Concrete Centre (UK). Task Group 1.6 High-rise buildings, within fib Commission 1: Structures, was drawn together with a mandate to write about the experience and know-how pertinent to the development, design and construction of tall concrete buildings. The group’s findings are presented in this state-of the-art report. Tall buildings are a unique challenge to engineers, even to those with extensive experience of low-rise structures. The bulletin explains the critical interfaces with other professionals, for example architects, building services engineers, façade and lift specialists, geotechnical engineers and wind specialists, highlighting how these parties interact with engineers and can influence and guide the development of the structural solution. The key factors in choosing the most appropriate structural system are discussed. The bulletin covers the criteria used to select the most economical structural elements including the foundations, the vertical elements and the floor slabs. Examples of common construction methods are presented and their effects on the structural engineering design are discussed. Tall buildings can undergo significant deformation during their construction and service life. These movements need to be understood by the designer and potentially compensated for in the design and during construction. One of the main particularities of the design of tall buildings is the dominance of the lateral loading from wind and seismic actions. The bulletin provides a discussion of these important topics and sets out the current approach taken by experienced engineers. Designers of tall buildings also need to understand the dynamic behaviour of the structure and confine the motion of the building to within acceptable limits. Approaches to damping and dynamic performance are discussed and guidance provided on the appropriate occupant comfort limits. Download the Corrigendum as a PDF file.